Mark Gronlund started in the jewelry industry as a self-taught goldsmith. His early work consisted of fabrication, model making, centrifuge casting, stone setting and finishing. Mark began his work as a professional lapidary in 1995. Self-taught in the discipline, Mark quickly earned his mark in the industry by winning the "Cutting Edge" portion of the 1996 AGTA Spectrum Awards, winning a total of three awards his first year. The following two years yielded five more AGTA Cutting Edge Awards. During this same period, Mark earned his Graduate Gemologist degree from the Gemological Institute of America. As a well-rounded, self-taught artist, Mark continues to devote his time and effort in the development of new and fascinating techniques in the lapidary field. 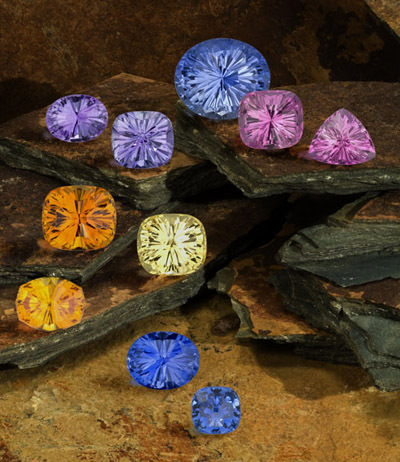 Recognized world-wide as one of the premier artistic gem cutters working today, Mark's unique creations have generated a new interest in jewelry for designers and collectors alike.